A place for anyone who loves food – buying, growing, cooking and eating! Cooking For Everyone – Affordable, Healthy and Easy-to-Do! This is a rather ‘warm’ vegetarian curry for all you who like a temperature raising dish. Dawn: Anyone who knows me, knows that my palate is rather mild in terms of curries of any kind. Andrew: Sometimes spicy is good, to bring out the true flavours of a dish. In a frying pan, put the onions and add a little cold water. Cook for 5-10 minutes until the white flesh of the onion begins to become transparent in look and the texture is softened. Add the tomatoes and chop them. Cook for 5 minutes. Add the garlic, turmeric, ginger and chilli powder; cook the combined ingredients for 10-15 minutes on a low to medium heat and stir. Dawn: If the ingredients start to look a little dry, simply add a little warm water and stir it in. Andrew: You might like to add a teaspoon of tomato puree, too, to emphasise the tomato taste. Now add the chick peas and cook for a further 15-20 minutes on a medium heat, stirring constantly. For more in the Cooking Duo’s “How to” essentials range and more recipes, follow this blog – www.forfoodlovers.wordpress.com – and our Twitter account @Love_Food_UK. You’ll also find us on Mumsnet Bloggers Network and Foodies100…oh, and did we mention Facebook? See you there for more fab food chat! 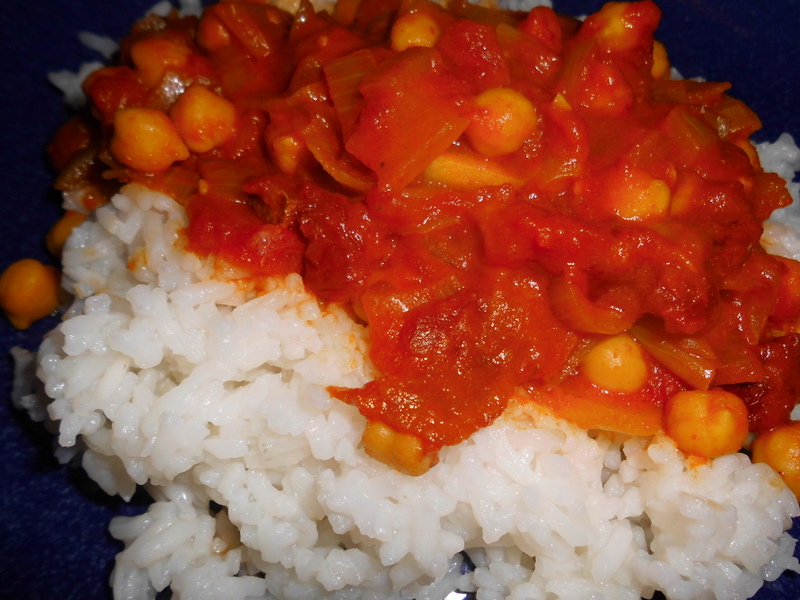 Posted on April 7, 2014 by Love Food UK	• This entry was posted in Dinner, Vegetarian and tagged curry, easy to follow recipes, Easy to make meals, spicy chickpea curry. Bookmark the permalink. You can now find us on Mumsnet too! Can I give you my new cook book?